The Flamenco Dance Museum was promoted by the dancer Cristina Hoyos and has opened recently. 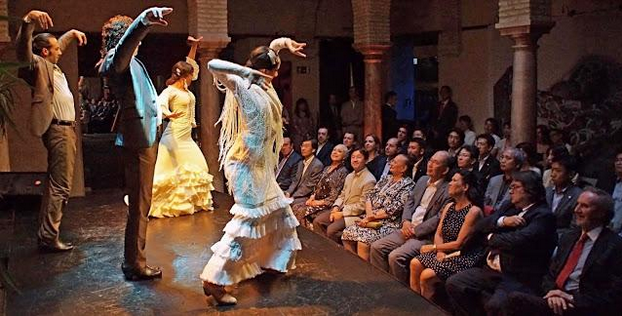 It is a cultural space located in the Santa Cruz and they organize activities related to flamenco genre. The museum s purpose is to serve as a platform for the dissemination of flamenco and other artistic expressions related to gender flamenco. So, on the one hand, exhibitions of painting, photography and printmaking on the origins and evolution of flamenco. The museum also houses samples of music, dance and costumes and percussion workshops and dance classes, among other activities. The museum offers live flamenco performances in the colonnaded courtyard every day at seven o clock. These take place in the central courtyard of the building, designed especially to develop this type of show in an atmosphere of intimacy and interaction between audiences and performers. The cast is made ​​up of both young talents as established artists. The capacity of the yard is quite limited so advance booking is recommended. Maravillosa taberna de barrio! ~ Muy buena comida y atencion! Entrada Libre! Gazpacho, Salmorejo, Esqueixada Griega, Ensalada de Ventresca y mas …excelente! More upscale clientele in Los Remedios.